The Lapa Rios Ecolodge in Costa Rica is an immersion in an ancient, timeless and beautiful fantasy of the world before humans than a resort, an exercise in “ecotourism” or “sustainable tourism,” located on a property of nearly 1,000 acres of flowered and fragrant rainforest, teaching its guests to cherish this breathtaking environment and helping to protect it in perpetuity. Best of all, we did it in the Christmas-January school-break period, when the summer vacay hordes are mostly at home and the heat is not so intense. Oh Costa Rica’s rain forest is still plenty warm, warm enough to enjoy plunging into the waterfall at the end of one guided trail hike, or the surf lessons one can get on the beaches far below. Located on the Golfo Dulce Forest Reserve – and on the edge of Corcovado National Park, 100,000 acres of biological diversity and endangered wildlife – Lapa Rios serves as a buffer against local deforestation and development. It’s also elegant luxury in the midst of some of the rarest natural beauty on Earth, but luxury of a different kind. No phone service, no Internet, no video games or televisions. Only the quiet sounds of the rain forest. And it’s about as far out in the wild as one can get in Costa Rica. Visitors approach Lapa Rios by small propeller planes, less than an hour flight from San Jose International Airport and touch down at Puerto Jimenez, a sleepy hamlet on a muddy little river on the tip of the Osa Peninsula, which overlooks the Golfo Dulce (SweetGulf) on Costa Rica’s southern Pacific Ocean coast.Then it’s less than an hour to Lapa Rios on the very tip of the Osa Peninsula, a lurching, bumpy ride in a “jungle taxi” along unpaved roads before arriving at the towering main lodge of Lapa Rios, a “palapa” of vine-bound poles and roofed with woven palm thatch, open on all sides and towering 50 feet to an observation deck reachable by a three-story, circular hardwood staircase. Below spreads the wet-green and deeply contoured jungle canopy, and beyond, from the southwest around to the southeast is the tropical ocean – an easy walk down to the shore from the resort, by the way. Hot and more than likely a little shaken and fatigued from the trip and the jungle ride, the tourist is greeted by crisply-attired staff members with an effusively warm welcome which includes tall iced fruit drinks pressed into their hands as they step down. Built of natural materials in harmony with the environment of the forest and the beach below, the main lodge is the focal point for just 16 guest bungalows, reached by paths and steps along the ridges. 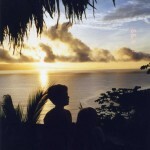 More than 350 feet above the sea, the lodge, its pool – where iguanas perch and squirrel monkeys leap and scamper and peer down at the swimmers and loungers from trees around its edges – and the observation decks of the bungalows, overlook the Golfo Dulce and its awesome sunrises. Cooling breezes flow from the gulf through the main lodge’s bar, restaurant and small library. Across the gulf and down the Pacific shore, one can actually see a far point of land that is Panama. At check-in, each guest is issued a flashlight and warned to look carefully even in the daytime for the fer-de-lance, bushmaster and other poisonous snakes that may show up on the paths between the lodge and the bungalows. Warned to shake out shoes in the morning, as tourists not uncommonly find scorpions where nobody wants to find them. Most often killed by snakebite in the Costa Rican rainforest, we are told, are people who practice the illegal hunting of monkeys, looking up at the treetops as they walk and not at the ground. Staff members at Lapa Rios are exclusively local people hired from the local community, with an emphasis on education and training. Where no school was available before, the owners have used proceeds from Lapa Rios to build a school for local children, the Carbonera Primary School on the border of the Lapa Rios preserve. The bungalows are smaller versions of the gargantuan main lodge, thatch-roofed palapas with attractive interiors of polished hardwood, and indoor shower in the bathroom and an outdoor shower on the deck. Every visitor has his or her own private observation deck, in other words, where one can watch the kaleidoscopic toucans and macaws gliding between the trees below, see in the trees all around them the howler monkeys, spider monkeys, white-faced monkeys and squirrel monkeys, witness the sunrise with a big-sky view. The mosquito nets that surround the beds draping on all sides from the high canopies are not really for mosquitoes. Guest realize this at night, when they look up to see the outside surface of the netting festooned with tarantulas and other fuzzy brown spiders big as a large man’s hand with fingers outstretched. The palm thatch is where the spiders hide in daytime. At night, visitors come into their palapas to find these characters from the movie “Arachnophobia” hanging on the screens that surround the palapa, perched on a towel in the bathroom or on a shelf where one has stacked one’s clothes and reaches up for a nightgown. That’s okay, though, because nature is what people come here for, and it forms a primary element of guest activities. There are guided night jungle hikes, pitch black except for the flashlights of the group, showing a night alive with insects and creatures like the kinkajou, its prehensile tail affixed to a branch above, its large and lustrous eyes returning the flashlight glare. Nature hikes aren’t the whole story, of course. Lapa Rios offers sea kayaking, surfing lessons (the waves of the gulf are not very big, but just right for learners), world-class sport fishing on the gulf and horseback riding down through the jungle and along the beach. But nature is the main attraction. On guided rain forest day hikes, one may see sights like the frogs that provide the poison for poison darts. There’s the local medicine walk, where a local native shaman points out medicinal plants and explains their uses – including, of course, as medicine against snake bites. There are dawn and dusk bird-watching guided walks; a guided walk of the beaches and tidal pools below the resort; a guided tour where visitors hike uphill splashing in and out of the clear Carbonera River to the toppling waters of a pristine waterfall; even a jungle overnight hike to a covered platform where one sleeps to the jungle sounds, surrounded by jungle sights, overnight. Or visitors can just relax. Some parents, while lounging on deck chairs by the pools and watching the squirrel monkeys play overhead, may be surprised to see their children quietly reading a book or playing a game of chess. No cell phones, no Internet, no televisions – Lapa Rios truly is about as far away as one can get.